China continues to vocally opposed the missile defense system, despite recent statements by the U.S. and South Korea. 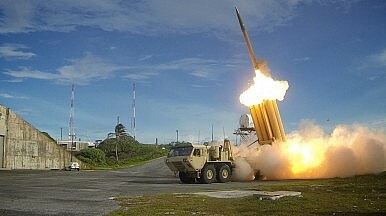 The U.S. Terminal High Altitude Area Defense system (THAAD) being deployed in South Korea continues to severely bother the Chinese administration despite both South Korean and U.S. officials explicitly stating that it is there purely to defend against potential North Korean aggressions. “North Korea’s accelerating program of nuclear weapons tests and ballistic missile launches constitute a threat to international peace and security and violate multiple United Nations Security Council resolutions,” U.S. Pacific Command said in a news release regarding the THAAD deployment. Experts say the threat from North Korea has increased dramatically since the turn of the decade, and that it is testing ballistic missile technology capable of carrying nuclear warheads. Earlier this month, North Korea fired a number of missiles, each capable of reaching U.S. military bases in Japan. While THAAD is intrinsically defensive and is designed in intercept and destroy short- to medium-range missiles as they re-enter Earth’s atmosphere in their terminal phase, Beijing sees it as a threat to its own missile forces. They may have a point. A major feature of THAAD is the AN-TPY-2 radar and its associated command and control system. The radar can determine what type of missiles are being launched, be they short-, medium-, or long-range missiles. Long-range missiles that are launched by North Korea, or say, China, toward Hawaii, or Alaska could not be intercepted by THAAD, but the radar could increase the odds of other U.S. missile defense networks successfully intercepting the missiles. The major problem for any aggressor nation is their ability to calculate how many missiles it would take to destroy a target. THAAD now puts those calculations into disarray, taking away any confidence of an overpowering surprise attack. The deployment of THAAD thus hurts Beijing’s image as an increasingly dominant military force in the region. Since the U.S.-South Korean agreement was announced in July, both the Chinese government and its media have rallied against the system as if the THAAD in itself was an attack on China. In return, South Korean companies have been targeted within China and tourism numbers to South Korea hae slowed. The soft attack on South Korea only intensified in the past month as the United States deployed its first THAAD components on a golf course owned by Korean conglomerate Lotte. Faced with this economic pressure, South Korea tried again to reassure China that THAAD would not negatively impact Chinese national security. “The THAAD system is the most minimum defense mechanism against North Korea’s nuclear missile threats. China has been overly assessing the radar and excessively protesting against its deployment,” South Korean Defense Minister Han Min-koo said. How did China-South Korea relations fall so far so fast?